Uwe Rosenberg’s worker placement game of medieval farming. Published in 2007 by Lookout Games. The 1st edition was distributed in English by Z-Man Games. The new 2nd edition is distributed by Mayfair Games. 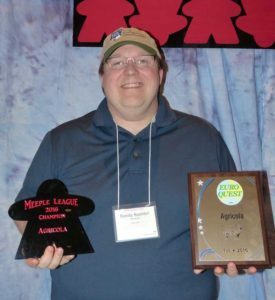 Agricola is featured for online play. It was featured for live play in 2015.